Amanda Stephenson sails for Charleston, South Carolina to start life anew after the death of her husband. She plans to follow in the footsteps of her ancestor, a mistress of King Charles II, who learned the secret to manufacturing soap that was gentle to the skin and aromatic to the nose. Plans go awry, however, when the ship founders on a reef and pirates come to the rescue. Locked in her cabin with a loaded pistol, she awaits her fate. Morgan Roberts, aka Captain Sinister, is a privateer. He and his crew are on their way home so his trusted friend, Gabriel Lopez, can marry his sweetheart. When Gabriel spies the Penelope, they decide to take one more ship – this time as wreckers. They board the ship, take the cargo, and release the crew in a longboat to find their way to shore. Extricating Amanda from her cabin, however, proves trickier than he expects, and in the ensuing struggle, she strikes her head and falls unconscious. Captivated by the spunky lass, he whisks her aboard his privateer where he attempts to woo her while she mends. Falling in love with a rogue is the last thing Amanda expects to do, but fate has a way of intervening in the best laid plans. She finds herself marooned on a Florida key with Morgan and Cesar, Morgan’s cabin boy. Pirates, with a reputation for leaving behind no witnesses, come ashore, and the three must devise a clever way to save themselves. When help arrives, Amanda learns the truth of the marooning, and wants nothing to do with Morgan. He, however, offers her something she can’t resist – a chance to fulfill her dreams – but she’s reluctant to accept. At the same time, the navy is looking for Morgan, for someone from the Penelope has accused him of piracy. To clear his name, he agrees to help Commodore Porter in his bid to rid the Caribbean of pirates once and for all. Pirates and love stories are a favorite of romance writers and readers, but few of these tales are set during the 1820s, long after the heyday of sea rovers. Fewer still examine America’s struggle to end piracy under the leadership of Commodore David Porter and the Mosquito Fleet of the U.S. Navy. Captain Sinister’s Lady is an exquisite love story that’s perfect for a rainy day or a lazy day on the beach, but it is not recommended for young adults or adults who dislike explicit love scenes. 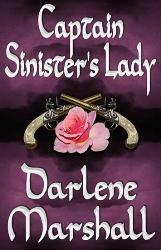 Darlene Marshall captures the reader’s attention from the first page, and never allows you to escape until the end. She deftly combines historical fact with fiction, and brings alive Savannah and Saint Augustine of old. The romance of Morgan and Amanda delights and thrills, recapturing the essence of old-time romances, while adding a few twists and turns that provide just the right spice. Although Sophia Deford may look like a demure, young lady, she’s anything but. A highwayman absconds with her guardian’s gold and her. While hiding in a cave, she knocks Jack out, dons his clothes and ties him up, buck naked, then relieves him of the stolen gold and heads to Portsmouth. Once there, she and Annie, her former governess, use the ill-gotten funds to purchase a bookstore, which allows them to live comfortably. A frequent visitor to their shop is a sea captain named Erasmus Tanner. On one visit, he leaves two sealed documents with Sophia. If he fails to return, he wants her to sail to St. Augustine in Spanish Florida and deliver the document addressed to John Burrell, his friend who’s also a sea captain. The other letter is to Sophia and includes sufficient funds for her to make the journey. When word comes that Tanner’s ship has gone down with all hands aboard, she readily makes her plans in spite of Annie’s objections, for respectable women don’t travel alone. After locating another woman, who’s moving to Spanish Florida to reunite with her husband, Annie reluctantly agrees to Sophia’s departure. Known as an upstanding sea captain in some ports, John Burell is actually Lucky Jack, a privateer with a letter of marque from Cartagena in 1817. He’s not particularly choosy about the vessels he stops, so when his men spot the English vessel, they attack. The instant he spies the imp who bested him, he’s determined to have his revenge. Once again, he absconds with the booty from the vessel and Sophia Deford. He’s not certain what he plans to do with her, but it certainly isn’t what ends up happening. Tanner’s letter reveals hidden pirate’s gold, but without Sophia’s knowledge of a secret map and clues, he won’t locate the treasure. The two form an uneasy alliance, although the secret intent of both is to end up with the entire hoard for him- or herself. Then they meet another privateer, Captain Sinister, who demands that Jack and Sophia allow him to marry them. Neither wants this, but they see no other way of safely returning to Jack’s ship. To complicate matters further, someone else – Sophia’s guardian – knows she possesses the clues to the gold. As far as she’s concerned, the gold is hers, and she’ll use Jack, her guardian, and anyone else she deems necessary to obtain it. But Jack isn’t quite as naïve as the highwayman whom she bested once before. He has his own designs on the gold and Sophia. Even if something of a misnomer – there are no buccaneers in this tale – The Bride and the Buccaneer is a wonderful romp through the wilds of Spanish Florida. Laced with a host of unique characters, intriguing clues that reveal the depth of Marshall’s research, and humorous lines, this spellbinding tale snares the reader from the opening page to the end. For those readers who may ask about Jack’s trick with the eye patch, yes, this does work, although there’s no historical evidence to prove pirates used it in this way. This delightfully entertaining romance is sure to capture a pirate lover’s heart, but beware – the explicit scenes may not be to all readers’ tastes. During a voyage to Jamaica in 1814, pirates attack the merchant brig where Charley Alcott assists the captain’s wife in giving birth. The pirate captain demands the English doctor’s presence aboard his ship, but Charley calmly tells him, “A dead surgeon is no good to you either, pirate. You are upsetting my patient. Get out.” After the baby’s safe delivery, Charley accompanies the pirate because to stay aboard the brig would mean the death of the baby’s father. The last thing David Fletcher, captain of the American privateer Fancy, wants is to pose as a pirate and kidnap the doctor, but his younger brother is seriously wounded and only Dr. Alcott can save Henry’s life. What David doesn’t realize is that Charley isn’t exactly what he appears to be. Charley is actually Charlotte Alcott, but she’s more comfortable in her guise as a doctor and her medical training, while incomplete, is sufficient to heal Henry’s wound. David refuses to set her free – his men need a doctor and morale has already improved, plus the doctor is the only person with whom David can be open. But the more time they spend together, the more complicated their relationship becomes, especially since he’s oblivious to Charley’s true identity and she refuses to tell him the truth. As love and betrayal unfold, the war between their two countries intervenes with deadly results. 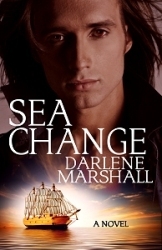 Sea Change is a fast-paced and captivating historical romance. The characters are well drawn and Marshall’s portrayal of Charley deftly shows how women of the period successfully passed themselves off as men while at the same time showing the difficulties and privations they faced in doing so. The depth of the author’s research enriches the story and transports the reader onto the ships and into the lush tropics of the Caribbean, be it in Jamaica or the brothel on Santa Rosa, during the War of 181. A rakishly handsome pirate captain, Robert St. Armand does what most men, long at sea, do when they put into port. He visits an exclusive brothel. This time, though, he imbibes too freely and can’t quite remember everything that he’s done; he’s also still groggy when he mistakes a drab, baggy-dressed visitor for a doxy, who upends a bottle of wine on him before stomping from the room. Governess Lydia Burke is aghast when she sets eyes on the scoundrel wearing nothing but his birthday suit. How can she deliver her charge, little Mathilde, into this man’s despicable hands? How can such a reprobate ever be a good father to a daughter he doesn’t even know exists? Lydia loves the little girl, and although she would like to stay with her, that isn’t possible. She has a new job on the Caribbean island of St. Thomas and, with Mathilde’s mother dead, it’s time that Captain St. Armand care for his daughter. Captain of the notorious Prodigal Son, Robert knows the instant he sees eight-year-old Mathilde that she’s his offspring. She immediately worms her way into his heart, but what does a pirate and sea captain – not to mention a crew of men, all of whom live aboard his ship – know about raising a little girl? He asks Lydia to accompany them to England, but she absolutely refuses no matter how much money he offers her to stay. Taking no for an answer, however, isn’t something he’s particularly adept at doing. While he plots and waits to put his plan into action, he and his daughter become better acquainted. If she’s to truly be part of the crew, she must first have a pirate name – Marauding Mattie, scourge of the West Indies – and second, she must learn to defend herself. At night, he reads her tales from Captain Johnson’s A General History of the Robberies and Murders of the Most Notorious Pyrates. Then, when a ship is sighted by the lookout, the Prodigal Son swoops in and kidnaps Miss Burke off that vessel. It should be smooth sailing, but the Royal Navy searches for pirates; someone keeps stealing Miss Burke’s caps and pins; and close quarters bring her and Robert into alluring and dangerous situations. They both have secrets, tied to England, that neither wants to share, but each left for a different reason. While circumstances necessitate his return – and he has definite plans on what he will do once he arrives at his boyhood home – Lydia’s reluctance makes him curious to know more and protective as well. Whatever danger lurks there, he will do whatever he must to safeguard the women in his life. Set in 1820, The Pirate’s Secret Baby is a well-researched historical romance spiced with humor. The story of Robert, Lydia, and Marauding Mattie weaves an invisible spell that tugs at your heart strings, and I particularly liked Robert’s non-violent, but oh-so-typically-piratical solution to thwarting Lydia’s nemesis. Near the end of the story, I thought once or twice it could have ended sooner than it did, but the final scene definitely ices the wedding cake. The host of refreshing, non-stereotypical, minor characters – such as two Mutt-and-Jeff-like seamen who go to school with Marauding Mattie and go her tea party, or the vicar who doesn’t mind if his daughter dons an eye patch and duels with a wooden sword – truly help bring this story to life. I’ve read several of Marshall’s previous pirate tales, but this is the best written and most intriguing one. I enjoyed it on so many levels. One reason I don’t always review her books, which are written strictly for adults, is because of the mature and explicit bedroom scenes that some may find objectionable. This is definitely true in The Pirate’s Secret Baby, but the majority of the story is a wonderful tale of cunning pirates and captivating would-be pirates. If those who may have reservations gloss over the more controversial scenes, I think you’ll enjoy the story as much as I did.